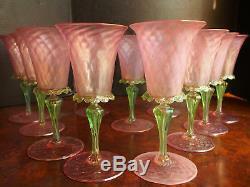 A Stunning Set of 5 Vintage 1950's Venetian Iridescent Pink Green Wine Champagne Stem Glasses Glass Goblets. 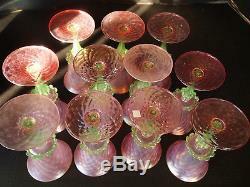 Each glass is about 8.5" tall x 4" diameter. 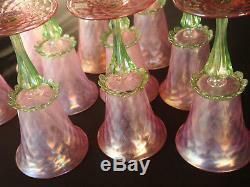 The main color is pink, or variations of pink, with green rim stems and "teardrop" edgings. 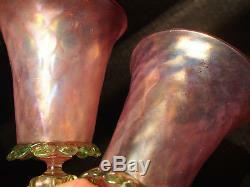 The bottom foot and the cup have a swirl geometric embossed designs. 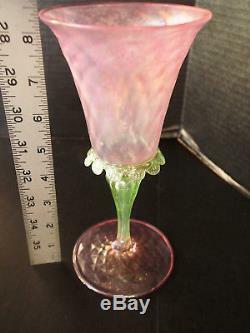 The center cut of the bottom glass is rough. 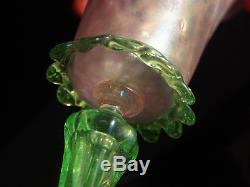 Depending on the light, the glass transparency color changes as I tried to capture in pics. They were stored away and preserved with the best possible care. 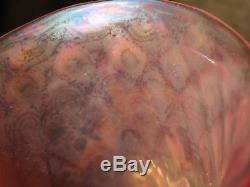 Some glasses have milky patina spots areas sort of speak with opaque reflex as shown last pic example. I don't know if that is from the manufacturing process, or if that happened after. To emphasize description those glasses have a "dishwasher effect", when it finishes its cycle and the glasses comes out opaque, not shining sort of speak. I'm not an expert in regards so I can't tell if that's a flaw. Please note in my description I try to largely describe my concerns especially since these are fragile tedious packaging items. In my humble opinion they look glossy shiny and the flaws described are minor, but again I need to be as accurate as possible. Otherwise they are a unique gorgeous set. 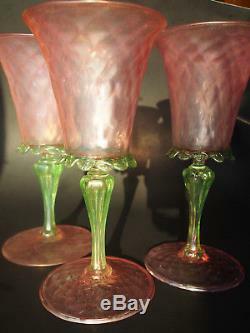 The set of 11 glasses shown in pics is divided in two sales, one sale offers 5 glasses, and another offers 6 glasses. 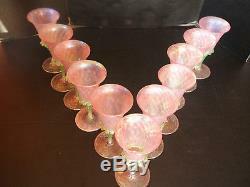 You will receive 5 chosen random glasses out of the set of 11. I do my best to accurately represent the items I sell. If I've missed something or you feel I've overstated the condition of an item, please contact me prior leaving feedback. 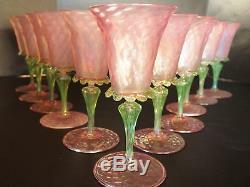 The item "5 Vintage 50's Venetian Iridescent Pink Green Wine Stem Glass Goblets 8.5 Tall" is in sale since Saturday, March 24, 2018. 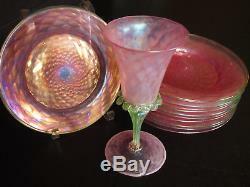 This item is in the category "Antiques\Decorative Arts\Glass\Stemware". 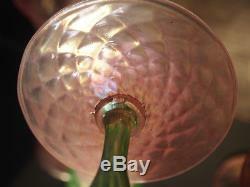 The seller is "gaia1751" and is located in Winnetka, Illinois.